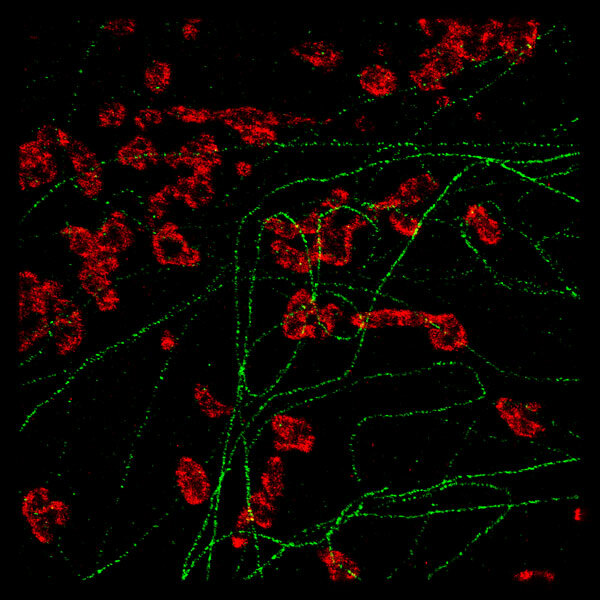 Mitochondria 647: COS cells stained for ATP-Synthase in inner mitochondrial membrane with Alexa647. Courtesy of Prof. R. Jacob, Philipps University Marburg. Developments in biological microscopy which result in the nonlinear response of excitation of fluorophores have provided researchers with greater resolution that previously available from standard microscopy techniques. 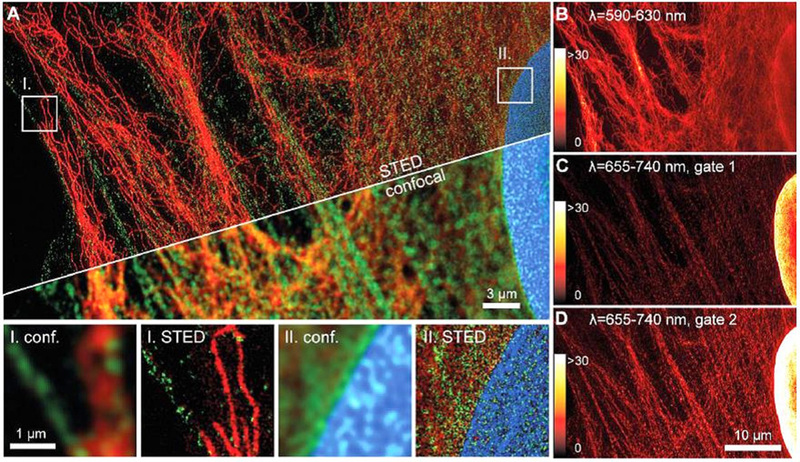 Stimulated Emission Depletion (STED), Ground State Depletion (GSD), Saturated Structured Illumination (SSIM), Stochastic optical reconstruction microscopy (STORM), photo activated localization microscopy (PALM) and fluorescence photo-activation localization microscopy (fPALM) are among the techniques used in Super Resolution Microscopy to have benefitted from the emergence of high power laser systems. MPB Communications is pleased to have developed High Power Visible Fiber Lasers in partnership with leading research laboratories worldwide which target wavelengths previously unavailable. The flexibility of our technology allows for the development of novel emission wavelengths for use in Super Resolution Microscopy where beam quality (TEM00, M2 < 1.1) and stability is a must (see Why M2 is Important). Using these novel wavelengths our research partners have been able to open up areas of investigation which have led to ground breaking developments. MPBC is proud to have been a small part of this new era and looks forward to the continued success of its partners. Three-color STED nanoscopy with one STED wavelength and excitation multiplexing. ATTO 590, ATTO 647N and KK114 were combined in one cell staining. (A) Unmixed RGB image of vimentin-ATTO 590 (red), α-actinin-KK114 (green) and lamin-ATTO 647N (blue) in STED and confocal microcopy images. (B-D) raw STED microscopy images of (A). (A) was smoothed with a Wiener filter. Görlitz, F., P. Hoyer, H. J. Falk, L. Kastrup, J. Engelhardt, S. W. Hell: "A STED Microscope Designed for Routine Biomedical Applications" Progress in Electromatetics Research, Vol.147, 57 - 68 (2014).